When I added this book to my list of suggestions for a new Book Group, I didn’t really think it would leap out and be the first choice for December’s meeting. Still, despite the fact that it has aged (well, I think) this is a novel to savour, not least for its wartime setting, which is an interest of mine, but also the quality of its writing. For those of you not previously acquainted with the writing of Mary Wesley, this is a novel written when she was in her seventies (which should give hope to us all!) in which she uses her own experience of what life as a young woman in the early 1940s was actually like. This she cleverly cuts in with the talk and memories of the characters much later, as they gather for the funeral of the most famous and infamous member of the older generation of those who gathered for dinner on a camomile lawn in August 1939. The lives of the male characters are equally vivid, as they perhaps seek comfort, an important theme for Oliver, courage and understanding of a world where nothing is certain, even life itself. The novel begins in a peacetime where war is threatened, but is difficult to believe in for many of the characters. There are painful memories among the older people, who know that war can mean loss of not only life but a future. There is disbelief that the Nazis are really that bad, even though two people have escaped from their long reach and suffer agonies of worry for a son left behind; there is still the persistent hope that another cataclysmic war can be avoided. This is not a war book in the sense of battles, or even descriptions of bombing. The war is a background which explains the coming and going of characters, the relaxation of inhibitions, the intensity of real emotions. There are no purple passages of “she felt”, “he realised” “she knew”. This is a prime example of the show rather than tell emotions; although Helena’s singular behaviour rather confuses others, the effect of her choices is so well observed that we do not need to wade through pages of self – analysis to see that when everything is changing and challenging, surviving is about more than dutiful self sacrifice. I had forgotten that this is a book which is not afraid to describe unorthodox relationships which can happen when survival is not guaranteed; a passing happiness or comfort becomes understandable if not commendable for many of the characters, even though surprises and confusion can reign. In short, this book is more racy than I remembered! This should not put you off, as the character who publicly claims “not to know what love is” is the one who discovers much in the course of the novel. The 1991 tv version of the novel is a fitting translation of the narrative which looking back features some amazing performances, but the characters are all there, drawn to near perfection in the book itself. Apparently Wesley’s books run in a sequence, so I will be seeking out my copies of her other novels soon! A blast from the past…do you remember this? 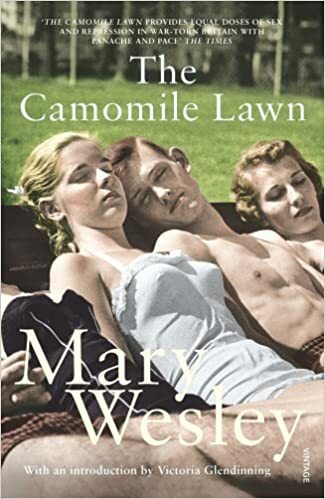 Another book that I finished while lurking in London was The Camomile Lawn by Mary Wesley. Younger readers may never have heard of this, but Wesley was an author first published when past the first flush of youth, but who carried on producing very readable novels for years. Some of them were rather racy, and this one is no exception. They have been showing the excellent adaptation on Yesterday, but I think that the Channel 4 iplayer thingie will still have it. The tv series was the first role for Toby Stephens, and other well known British actors.Worth watching for that alone, but it is also an excellent series. The novel is set in the summer of 1939. Oliver has been injured in the Spanish Civil War, but returns to his Uncle Richard’s Cornish house with his cousins. There they join forces with the younger Sophy and the Rector’s twin sons to complete the “Terror Run” along the cliffs. But a greater terror approaches as the War is declared. Aunt Helena becomes involved with a refugee violinist, Richard with his wife, and at least two generations are swept along in a wartime of air raids, rationing, and convoluted relationships. Much of the novel is commentary from decades later as a funeral draws many together. This is such a readable novel that it makes a good change from some of the more literary and heavy books that I have recently struggled with. The characters are well drawn and the connections are interesting. The period details are accurate, as is the sense of loss and danger as well as the petty jealousies and attractions. The plot is complex, and some angles do not hold together, but this is not a deeply researched and academic book. Some elements feel a little rushed, and it could have been a longer book, but it is enjoyable and sufficiently human to draw most readers in. It probably fits into the “guilty pleasure” category, but it is none the worse for that. Anyone with a passing interest in wartime Britain and the emotions that erupted within it would find this a worthwhile read. It is a good book, written by someone for whom it wasn’t history but knew what it was to live in exciting, dangerous times. Leave a comment A blast from the past…do you remember this?